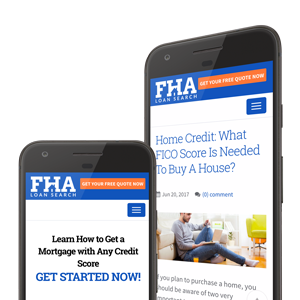 Home Loans for Bad Credit from FHA Loan Search - View our Blog Today! When you apply for a home loan, your credit history plays a very important role. If you happen to have low or bad credit, your ability to gain a mortgage will be compromised and your interest rate is subject to the lender’s discretion. This is because lenders will see negative financial history as a risk factor and would think that you will be more likely than someone else to default on the loan. With a struggling economy and an increase amount of foreclosures, obtaining a loan is already very difficult and the available interest rates will fluctuate based on market factors. Your credit report needs to be highly accurate and free of any inconsistencies and errors. If you see any mistakes, you might want to send in the relevant documents to clear out those mistakes with your credit company. Typically you will want to give yourself about six months of time to ensure that you are able to iron out any concerns. If you have bad credit, you might have to pay a higher interest on your loan to counter this issue. Make sure you are prepared for either this or an ARM which consists of changing interest rates. You should be able to show your creditors that you have a steady income which will be enough for your monthly mortgage payments. This will increase your chances for a mortgage despite bad credit. Generally speaking, there is specific paperwork that you can put together in advance to save you and your loan officer some time while shopping for the best loan quote. A greater debt to income ratio will give you a tougher time in qualifying for a mortgage, especially if you have bad credit. Therefore, make sure that you pay all of your credit card balances and all the other loans before seeking a mortgage. If all your current debt is paid off, you will increase your chances of getting a loan, despite bad credit. Essentially, showing a history of financial responsibility is what you are doing here. If you increase your down payment considerably, the lenders will automatically start having more faith in you. This is because you will come off as a serious investor who would not want to lose their house under any circumstance. It will also show how good you are at saving money and that you are open to more risk in the transaction. A high down payment will often get you a lower interest rate and should reduce your overall cost of borrowing. If you have a valid explanation for all the negative items in your credit report, then you should write those down and prepare for that potentially awkward but important conversation. For instance, health problems or a recent divorce are understandable reasons for why you may have been unable to pay off certain bills. There are certain government programs which have far more flexible payment options and credit requirements. Consider those choices for your next loan as there may be something that appeals to you or is best suited for your unique situation. If a friend or a relative with a good credit score can co-sign your loan, then that will be a great advantage for you. However, do keep in mind that they will be responsible in case you default so be sure that you are setting yourself up for success. Do you have any further questions regarding applying for home loans despite having bad credit? If you do then Get Started here to speak with our experts and get a no obligation quote today. A one-to-one conversation is the best way to get serious about your next home purchase and we will be more than happy to answer any of the questions you might have.